A loan of $500 helped to buy animal feeds and two dairy goats. Esther is happily married to James and they are blessed with two children. 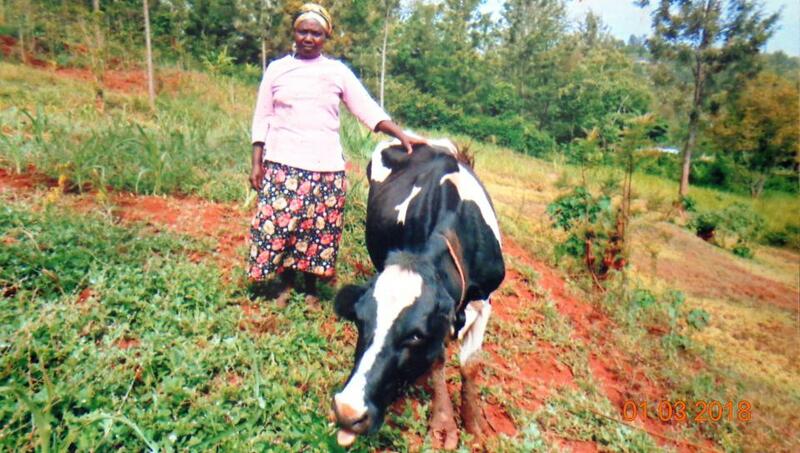 She does mixed farming with her husband, growing vegetables and other food crops, as well as farming dairy cows. She is a hardworking lady as she is well known and enjoys the proceeds she gets from milk sales. Due to increased milk demand, she is requesting a loan of 50,000 Kenyan shillings (KES) to buy animal feeds and two dairy goats. Her profits will pay off her loan quickly as this is her second loan cycle. Her dream is to be a prosperous dairy farmer. It finances smallholder farmers to purchase supplies and agricultural equipment. This loan is designed to empower small to medium-scale farmers in Kenya, where agriculture employs more than 75% of the work force. ECLOF Kenya’s loans support a range of agricultural needs, including horticulture and the purchase of farm inputs such as fertilizer, seeds, animal feeds, vaccination and farm equipment. Loan terms are structured around the maturity of the crop and/or the payback period of the inputs purchased. Additionally, ECLOF Kenya hopes to provide loans to farmers for the purchase and installation of water harvesting and storage equipment like water tanks or sinking shallow wells. By funding this loan, you are helping small-scale farmers increase their production capacity, providing employment opportunities and often contributing to food security in the country. ECLOF Kenya provides financial and non-financial services to micro, small, and medium entrepreneurs in all sectors of Kenya's economy. Most of the borrowers with ECLOF Kenya are engaged in commercial and retail activities, with a substantial number engaged in service businesses and agriculture. The organization is also committed to supporting low-income students in Kenya by providing student loans and in turn providing many students with opportunities they otherwise would not have access to.The rural/urban mix is nearly 60/40, with greater growth constantly coming from rural clients. Just like Kiva, ECLOF Kenya’s goal is to contribute to a world of human dignity and prosperity by providing access to fair financial services that lead to the building of sustainable communities.